Directed by Phillip Noyce. 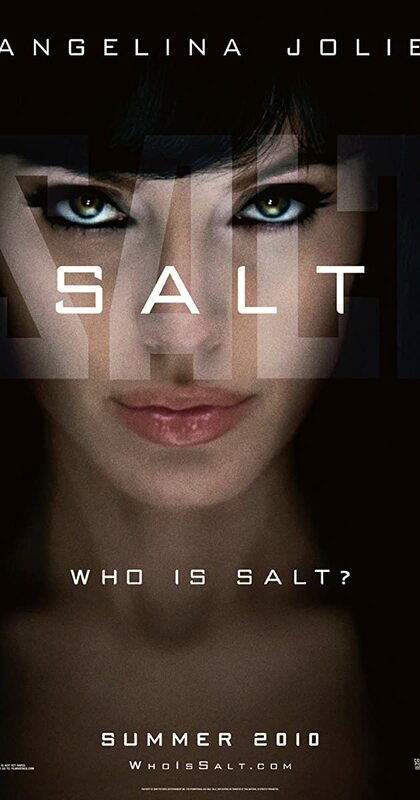 With Angelina Jolie, Liev Schreiber, Chiwetel Ejiofor, Daniel Olbrychski. A CIA agent goes on the run after a defector accuses her of being a Russian spy. Definitely very engaging. The tough part is that Salt is incredibly quiet and all of her life is very internal for the entire picture, so we’re left only to try to puzzle out what she’s thinking and what her motivations might be. We’re simply left with a handful of flashbacks which are seen (generally) from her point of view. As a result the audience needs to suspend their disbelief several times and rely on a bunch of deus-ex-machina. Still not bad. I could be induced to watch this again just for the fun of the romp. I definitely wasn’t surprised to see Noyce directing such a piece. Upper level journeyman action set piece all the way.